*Times subject to change based on enrollment. Angie Baker was born and raised on the pool decks of Redding and swam competitively since the age of 6. She has always had a love for aquatics and is excited to share that passion with her Redding community. In 2003, Angie moved to Arcata for college; where she earned a B.S. in Kinesiology at Humboldt State University and met her husband, Joe (at the pool of course!). 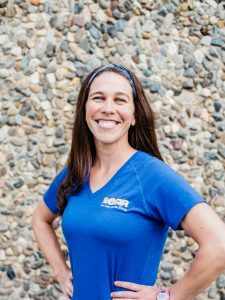 While attending school, she worked as the Head Age Group Coach for the Humboldt Swim Club and a Swim Lessons Supervisor for the Arcata Community Pool. From there, Angie interned as a P.E. Teacher at The International School Villa Amalienhof in Berlin, Germany. She and her husband then moved to San Diego in 2010; where Angie was the Head Coach for Coronado Navy Swim Association and taught private lessons for 2 years. She and her husband have slowly been making their way back north, from the Bay Area to Chico; where Angie continued coaching and teaching swimming. Angie and her husband moved to Redding in September of 2015 to settle down and raise a family. They have 2 sons, Che & Cam. Angie is looking forward to being a part of the Sun Oaks team and thrilled to bring her swimming expertise and enthusiasm to our Redding community. Angie’s personal motto is, “Attitude is Everything.” She believes that with a positive attitude and a strong work ethic, you can accomplish your goals. Stop by and say hi to Angie on the pool deck! 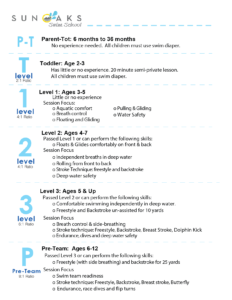 Parents love our Group and Private Swim Lessons! As a former competitive swimmer and father of small children I am very happy to endorse Angie Baker and the Sun Oaks swim program. I have seen dozens of coaches over the years and experienced many different coaching styles. Angie is the perfect fit for children learning to swim or trying to turn the corner to the next level. She understands the fundamentals of swimming, stroke technique and the critical aspect of interacting with young kids undertaking this sport/activity. We have the utmost confidence in her coaching and the care of our children. Ms. Angie is a phenomenal swim teacher. Our 4 year old, Willow, looks forward to each swim lesson and is acquiring skills quickly. She is currently in level 2 and they are working with basic strokes and breathing techniques. Ms. Angie is fun, enthusiastic and very talented with the children. Her love of her job is evident every week. I think Ms. Angie can take our Willow to the Olympic level within the next 5 years if she keeps up this pace. Once you reserve a spot, Group Lessons are NON-REFUNDABLE. However, a refund will be permitted if we are able to fill your space. If you miss a class, there are no “make-up” lessons. Our classes run full & there is no room to adjust for missed classes. Once Private Lessons are scheduled, we need 24 hours to adjust for cancellations. If 24 hours notice is not given, you will be charged for the lesson.